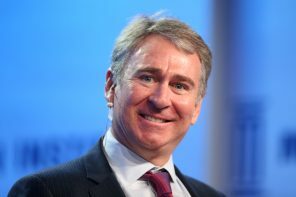 The hedge fund billionaire has bought a 95 mln pound pad in the UK capital, according to the FT. In a market hit by pre-Brexit jitters, that’s a vote of confidence of sorts. Yet Griffin’s 34 pct discount – over twice the average for similar dwellings – limits the good vibes. After a long dry spell on the mainland, the private equity firm co-led by Jim Coulter will now work with CICC to pursue deals. Overseas funds have struggled to find targets, but also generate better returns than local rivals. It makes a partnership model worth testing in China. After a long 12-year investment in the payment processor, a sale to Fiserv sets the stage for a profitable exit. It’s a wonder the $29 bln buyout survived the financial crisis, considering the debt and multiple CEOs. Anything better than breaking even amounts to a win. The latest top-level promotion suggests a Mark or a Rob will succeed boss Larry Fink. The $6 trln asset manager aims to have women in 30 pct of its most senior jobs by 2020. For now, it’s falling far short of that. It’s a case where good stewardship best starts at home. NordLB needs at least 1.2 billion euros to help provision dud loans after merger talks with rivals failed. Along with smaller Italian peer Carige, the regional German lender is a prime candidate for resolution. Politics means a mix of private equity and public funds is a likelier solution. Buyout firm Apollo may bid for the best bit of GE’s finance arm, testing CEO Larry Culp’s commitment to decluttering the U.S. conglomerate. Unless he can get a knockout price, though, selling a crown jewel could leave Culp looking like he’s out of options. Masa Son’s main partners have balked at pouring more cash into the office-space provider, according to the FT. That undermines the idea of him as a visionary tech investor. It also makes it harder for the $97 bln vehicle to negotiate future deals – or set up a second fund. Rising bond yields and volatile markets mean the leveraged finance boom is over. The lenders which financed it have taken more risk than ever, and given away the ability to control struggling companies. When deals do go bad, they will get back much less than they are used to. Equities look overvalued, economies are slowing, and the world’s two biggest economies are at loggerheads. In 2019 there will be high flyers, high jinks, and more people getting high. But there are too many high-stakes situations for there not to be plenty more left high and dry. Lenders and shareholder activists rarely gel. But the Nordic bank welcomed the Swedish fund’s 2.3 pct stake. Cevian’s proposals for cost cuts are less radical than, say, a breakup, but could push Nordea’s return on equity to 14 pct. Its surplus capital could be a sweetener. How low can private equity returns go? Buyout shops target a 15 percent return, but 5 percent could be the new normal. Here's how a five-year deal could measure up. Buyouts have tended to target – and achieve – an annualized harvest of at least 15 percent. It’s hard to see recent deals, with high valuations and creative treatment of earnings, matching that. Assume a modest drop in the market and mild slowdown, and 15 looks more like five. The U.S. private-equity firm’s stake in Diamond Bank is worth only a fraction of what it paid after the ailing Lagos-based firm agreed to sell itself to Access Bank. A likely rights issue may worsen the financial pain. Carlyle's consolation is a slice of Nigeria’s biggest lender. Scout24, which hosts online ads for homes and cars, ticks two boxes for possible private equity suitors: it’s cheaper than peers and has lower margins. But a buyer like Silver Lake would struggle to load much more debt on the firm. Looming regulation is another threat to returns. Payments app Toss is the latest of a handful of local startups to secure a $1 bln-plus valuation, after fundraising led by U.S. investors. A wealthy, tech-savvy market is nurturing a new breed of tech firms that can stand out abroad too. SoftBank and others are taking notice. The buyout group has won a rare New Zealand bid battle, buying Trade Me, a mix of Craigslist and eBay. That's fair, for a local champion with little debt and chunky margins. Apax has similar assets elsewhere, too. Only Amazon's looming spectre should unsettle.